Data gets a visit from a woman who claims to be Dr. Soong's ex-wife--and thus Data's "mother"--but she might not be exactly what she appears to be. Data is appropriately skeptical, which is a nice growth in his character following episodes like "Legacy," in which he is pretty gullible. I love all the subtle clues that Dr. Tainer is an android--her "luck" with complex calculations, for example--and that Data is slowly catching on. It's also very clever writing that Data expresses his suspicions with the words, "I have reason to believe she is not who she claims to be." Given his skepticism early on that Dr. Tainer is not his mother, along with the way many other episodes of Star Trek have played out (like "The Dauphin," "The Survivors," "A Matter of Time," and most notably "Interface"), it's setting up the coming plot twist with a nice bit of misdirection. There are some interesting parallels between this episode and "Rightful Heir," in which Kahless the Unforgettable apparently returns, only to be revealed in the end to be a clone of the real thing. There's a different focus--"Rightful Heir" deals more with faith and religion, whereas "Inheritance" deals with the nature of humanity and family in the context of artificial intelligence--but the character arcs for Worf and Data are nearly identical. Data says his blinking--and Dr. Tainer's--is dictated by the "Fournier system." A Fournier series is a way of "decomposing" multiple oscillating functions, and it's pretty easy to see how you could use complex oscillations to create a periodic system that would appear random. It's way over my head, so I have to give mad props to whomever included that little nugget. It's great that we get to hear Dr. Soong's side of the story, but when he talks about Juliana leaving him, it presents a continuity problem. How did he program and plant the chip into Juliana's positronic brain after she left? Juliana says to Data, "On Atrea, there is a saying: a child born from parents who love each other will have nothing but goodness in his heart. I guess that explains you." This is a really warm and fuzzy sentiment, but uh, what about Lore? Though this episode can seem a little slow and boring at times, it is a very good character study of Data that delves pretty deep into the philosophical problems of artificial intelligence. Juliana spending so much time discussing Data's childhood is more than just cute; it reinforces that there is a very human connection between Juliana and Data, long before it is revealed that Juliana isn't even human anymore. When she confesses that she forced Dr. Soong to leave Data behind on Omicron Theta, her guilt and pain is real, as is the underlying question that raises about whether an artificially created offspring is somehow less valuable than an organically created one. The reveal, then, that Juliana is actually an android is more than just a cool plot twist; it's the ultimate expression of the philosophical question underpinning the story. If an artificial life-form can mimick a real person in every way--even in believing that it is a real person--does that make it real? 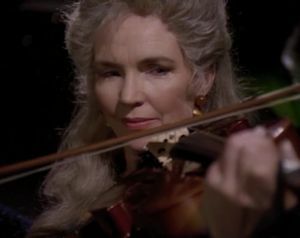 The actress who plays Juliana Tainer, Fionnula Flanagan, in addition to being Lost's Mrs. Hawking, also appears in DS9's "Dax" and ENT's "Fallen Hero."